As Debra’s and Jim’s paths cross with the teenagers, they form unusual friendships—and their lives are changed in surprising ways. 2.0 out of 5 starsVERY SLOW READING. I THOROUGHLY ENJOYED THE FIRST FOUR BOOKS IN THE COPPERHEAD CREEK SERIES, BUT THIS ONE WAS DISAPPOINTING, MUCH TOO SLOW, AND NOT ENOUGH STORY, VERY REPETITIVE. 5.0 out of 5 starsA beautifully written double-dose of heartwarming romance. 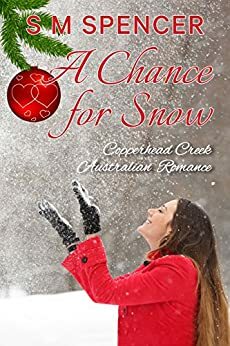 Ms Spencer's latest book, A Chance for Snow, is a heart-warming story, beautifully written story about love, sacrifice, disappointment and fulfilment. I loved the two stories intertwined, and how a person's age doesn't always define their level of wisdom. I have read all of Ms Spencer's books, and thoroughly enjoyed every one of them. I really enjoyed this book! It's really two romance novels in one. I loved the fact that this book suits readers of all ages. I hope the author does more books in this series as it feels like family! Debra is anxious to get out of town and make a fresh start where no one knows her past. Jim is immediately attracted to her, but feels their age difference is too great. Megan, meanwhile, dreams of a white Christmas and of her longtime best friend, Porter. For his part, Porter wants the very best for Megan--even more than he wants her. Navigating new starts, life changes, and budding romance, the four learn more about love and what it truly means to live their best lives in an Australian Christmas. I'm not much of a romance reader, but I thought this book flower well and was very well written without falling into the tropes so many romances suffer from. The characters felt real, and their struggles felt true-to-life rather than stereotyped. Some of the romantic content was a little outside my comfort zone--some very mild sensuality, mild suggestions of cohabitation, divorce and remarriage as a small plot point, and a scene involving a stripper at a bachelorette party, though nothing at all graphic is described. Despite this, there is no overt sexual content and the romances themselves remain pure, which I appreciated. Overall an enjoyable sweet Christmas read for those who enjoy a good romance. I loved the way 's. Spencer wove two romances together in this sweet romance. In one a young girl has a dream to experience a white Christmas during a holiday visit to relatives in North America. It is a hope she clings to as her hope for a scholarship and a future with the young man she loves slips away from her. In the other romance the woman who the town views in a negative way has determined to make herself over physically, emotionally, and professionally. She's ready for a new life when life throws an unlikely man into her path at the worst time, right when she's ready to start over somewhere else. I loved how the stories of the two couples interweave and the way characters from other books in the series make appearances. A delightful books filled with twists and turns. Reading this book was like taking a trip to Australia. I enjoyed the way people talked (using words like shout for treat), and the sunny, warm Christmas. I also enjoyed the fact that there were two love stories and how they enhanced each other. I thought Porter was adorable and I found it amusing how the younger couple was more sure about what they wanted than the older couple. But then again, that also makes it very real. There were parts in the beginning where I felt like I should have known some things about the characters already but I assumed it was because I hadn’t read the previous books. All in all, a fun, light, interesting read. 5.0 out of 5 starsWhat An interesting story. Great story with great characters including Porter and Megan and Jim and Debra and many others. I hated to see this book come to an end, it was that good. And, of course, learning more about Australia is one of the best things about this story. Now I hope to find another book in this series. A book I found a lot of storyline lost. Was not sure where a Chance for Snow came in to play .slightly confused until the end .